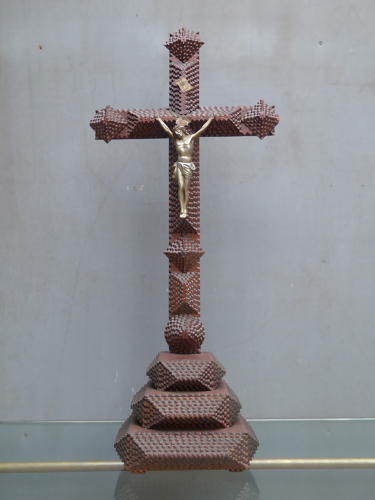 A beautiful example of a large antique tramp art crucifix. A stunning & early piece of tramp art with a wonderful age related patina, intricately layered in the traditional manner with notch carved wooden strips & finished with a detailed metal corpus. Tramp art was made by untrained artisans from around 1880 & was naively made using easily obtained materials such as cigar boxes, natural wood & reclaimed fixtures & fittings. This piece is an exceptional surviving example of such work & displays beautifully. Wear commensurate with age as pictured, very good overall. Unrestored.